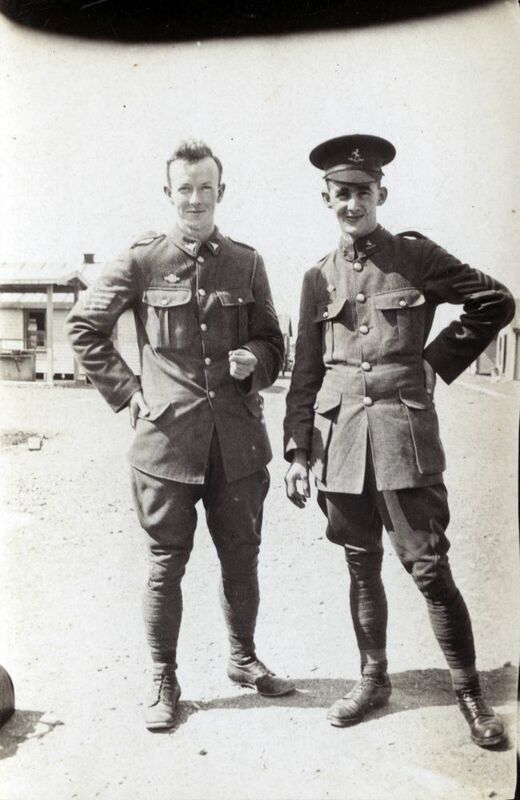 Sergeant Norman Shepherd (left) with another sergeant at Featherston Military Camp. Born in Auckland in 1896, Norman Shepherd came to the Wairarapa about 1905 when his mother and step-father moved to the Clareville area. Norman attended Clareville School and had his first taste of military life in the school cadets. He was keen enough to try for a territorial commission in 1913 but was too young. Norman trained as a compositor with Carterton publishing company Roydhouse. He was also a junior member of the Carterton Volunteer Fire Brigade. Norman enlisted in 1915, joining the Mounted Rifles, service number 9/1488. After training at Tauherenikau Camp he departed with the 7th Reinforcement in October 1915. He arrived in Egypt for further training, just as the Gallipoli Campaign concluded. His life in the active zone was to be brief : Norman caught rheumatic fever and after a spell in hospital was shipped back to New Zealand, unfit for overseas service. This was confirmed by a medical board on arrival in New Zealand. He was able to continue his military interests as a home serviceman, working at Featherston Military camp until war’s end. He became a clerk in the commandant’s headquarters, rising to staff-sergeant by the time he was discharged. After the war Norman worked briefly in Masterton as a compositor before moving to Featherston as a reporter for the Wairarapa Standard. In the 1920s he became a professional secretary and agent, representing local organisations such as the Automobile Association, Wairarapa Racing Club and the new Wairarapa Electric Power Board. He married Evelyn Devereux in 1921; the couple having two children. Norman became a Featherston Borough councillor and was deputy-mayor. He remained a keen shooter throughout his life. He also served in the 5th Independent Mounted Rifles, a south Wairarapa unit, in World War Two. Norman died in 1976 and is buried at Featherston Cemetery.